Pay by Credit Card Online: A payment confirmation will be emailed to the participant. Pay by Check: Untick the default selection for credit card, and tick the remaining option. You will receive an email that you owe fees. Print the email and include it with the check. Mail to the address below. Checks must be made payable to USF HPCC (USF Health Professions Conferencing Corporation). Federal ID number is 16-1765073. Only US Dollars are accepted. A $25 fee will be charged on any returned checks. USF Health Professions Conferencing Corp.
Main Conference: Attendance at the conference, continuing education credit as applicable, syllabus, refreshment breaks, lunch, and poster walk. The syllabus will be electronic, and available for downloading in advance. If single day registration is chosen, the ceus correspond with the time spent in educational activity, and only the activities scheduled for that day are included. Refund & Cancellation Policy: Cancellations must be requested in writing via email to cpdsupport@health.usf.edu, and received by January 7, 2019 in order to receive a refund. A $50 cancellation fee will be assessed to cover administrative costs. There are no refunds for no-shows or for cancellations received after January 7, 2019; however, substitutions are welcome without penalty. USF Health Office of Continuing Professional Development reserves the right to cancel this activity due to unforeseen circumstances, in which case, the full registration will be refunded. USF Health will not be responsible for travel expenses incurred by participants in the unlikely event that the program is cancelled. Confirmations: Confirmation will occur upon completion of the online registration. Payment Policy: Checks must be made payable to USF HPCC #177 (University of South Florida, Health Professions Conferencing Corp., program #177). Payment by credit card may be done via online registration. Visa, MasterCard, Discover and American Express are accepted. Payment is in US dollars only. Therefore, all credit card transactions are processed in US dollars and are subject to the current exchange rate. Questions or Assistance: If you have activity questions or concerns credit, please contact cpdsupport@health.usf.edu or call 813-224-7860. Equal Opportunity & Accommodations for Disabilities: USF is an Equal Opportunity / Affirmative Action / Equal Access Institution. The perfect escape! 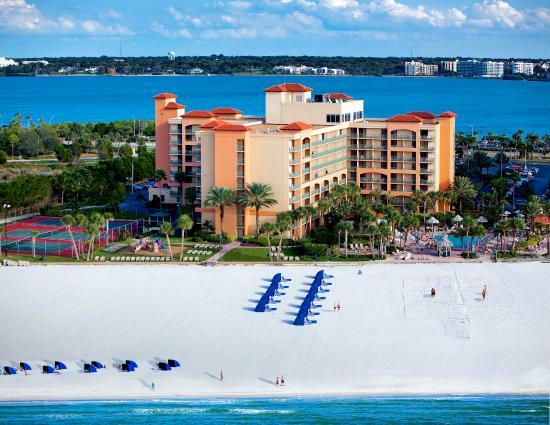 The Sheraton Sand Key Resort is a unique beach hotel on Clearwater Beach: One of America’s top ranked hotels for hospitality, on one of America’s top rated beaches. The resort offers 390 accommodating rooms and suites overlooking the Gulf of Mexico and the Intracoastal Waterway. Resort amenities abound! Golden Spoon and numerous specialty dining awards recognize Rusty’s Bistro as the top restaurant on Clearwater Beach. A limited number of rooms have been reserved for this meeting at a special rate of $189 + applicable tax, currently at 13%. Rates are based on single/quad occupancy. The deadline date to obtain the group rate is the end of the day on January 4, 2019. Don’t delay making your hotel reservation. Reservation Method: Two methods are available. Car Rental: Tampa Airport has many rental cars available. Hotel parking is complimentary to attendees.